FSU Art Professor Paul Rutkovsky and FSU BFA ’13 Marium Rana provided art classes for the residents of the Shelter this semester. This exhibition will show the art made during that time. 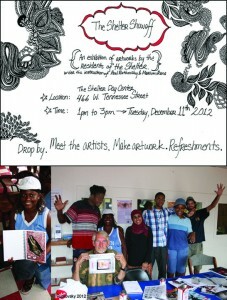 Please come to The Shelter this Tuesday for the SHOW OFF art exhibit. You’ll meet the artists, and enjoy good food from Rasta Nice Foods.